Let’s start with some real talk about jackfruit. It’s huge. It’s heavy. It takes a long time to prepare. But it’s so, so good. So if you have the time, and the inclination… or if you’d just like to look at one, come along for the ride. Jackfruit is an enormous tropical fruit that has a thick, fibrous texture. It’s about the size of a large watermelon, and it weighs about the same too – but it has hard, prickly skin. 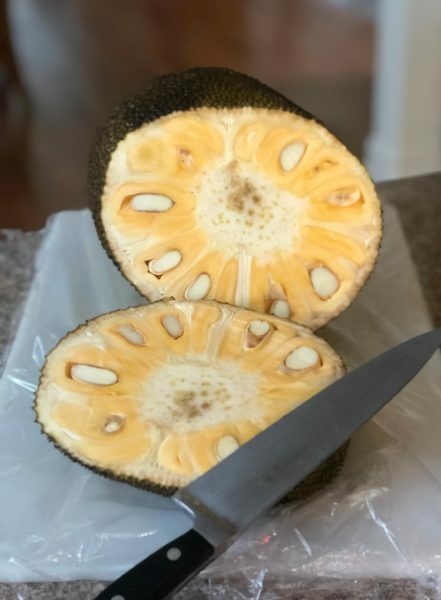 It’s probably most famous for its use as a meat substitute (when you cook it down, the fruit has a stringy texture that’s analagous to shredded beef or pork). When the fruit is ripe, you can eat it raw (it tastes like a not-too-sweet combination of a banana and a pineapple). Jackfruit is available in many stores in canned form (either in brine or in syrup) and it’s frankly easier to cook that way. But if you’re like us, you like the adventure of cooking something crazy… and you hate the idea of starting off any recipe where the starring ingredient comes from a can. 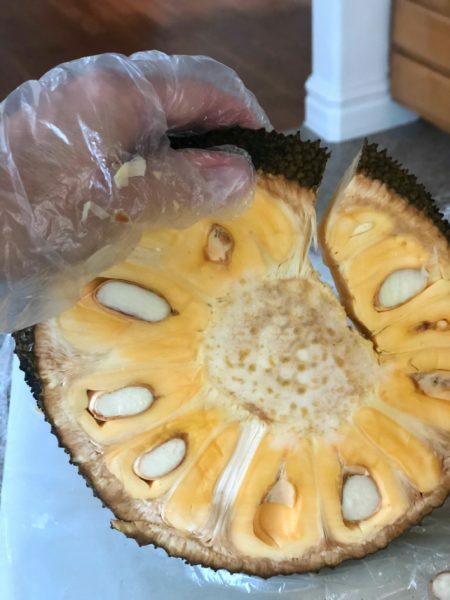 So you dive in to a whole fresh jackfruit (we got this one from Melissa’s Produce) with a knife, a plastic-wrapped cutting board, and plastic gloves. Gloves? 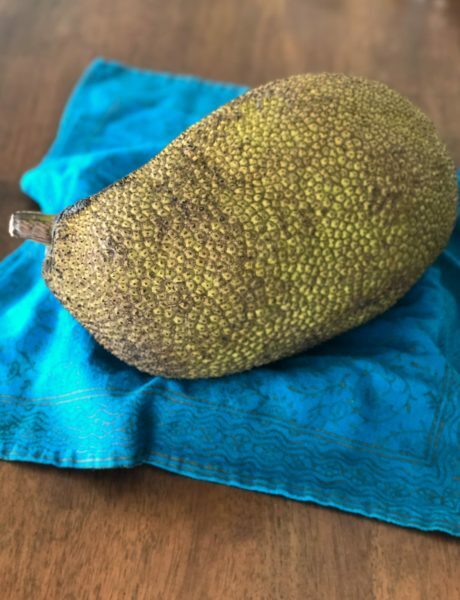 Yes, the jackfruit has a sticky resin inside that can be hard to clean off, so you’re best if you start out this project with a little protection. 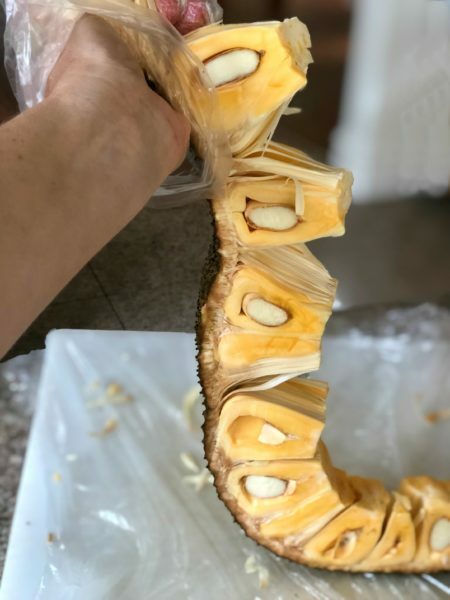 Using a sharp knife, cut thick cross-sections of the jackfruit so that you have several large discs to work with. Next, cut a line through one of the discs into the center, and carefully cut out the hard round center core. Open up the circle, and you have a nice long strand of jackfruit flesh and pith to work with. The main part you’re going for is the thick, golden pods that encase the seeds. You’ll want to pull out the seeds (apparently you can eat the seeds too – they can be roasted or boiled and taste like chestnuts) and also pull away the membrane that surrounds the seeds, as well as the white pith. You’ll be left with a pretty golden curved piece that looks like a pouch – and tastes faintly sweet. Now, what to do with this golden abundance? We’ve got some great choices for you – How about some amazing Vegan Shredded BBQ Jackfruit Sliders? Or even better – a Jackfruit Upside Down Cake? 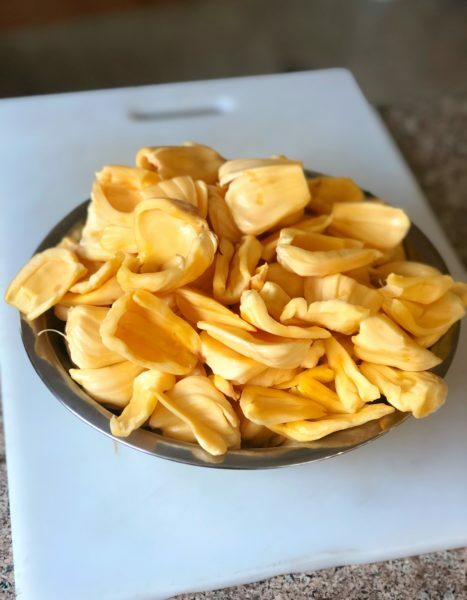 If you’ve created something delicious with fresh jackfruit, let us know! We’re always looking for a good project.